Sustainability is one of the most important issues currently facing the tourism sector. Recently, the role of resilience thinking has been highlighted in sustainable development discussions as an alternative perspective. This book approaches these concepts as interwoven processes and looks at change through a socioecological lens. Resilient Destinations: Governance Strategies in the Transition towards Sustainability in Tourism, London, Routledge. Saarinen, J. & A. M. Gill (2019). Introduction: Placing resilience in the sustainability frame, pp. 3-12. Saarinen, J. & A.M. Gill (2019). Tourism, resilience and governance strategies in the transition towards sustainability, pp. 15-33. Brouder, P. & J. Saarinen (2019). Co-evolution and resilient regions: Moving towards sustainable tourism development, pp. 67-76. Gill, A.M. & J. Saarinen (2019). Conclusions: Challenges and opportunities in the transition towards sustainability. In Saarinen, J. & A. M. Gill (Eds). pp. 189-196. Instead of seeing resilience and sustainability as alternative approaches, Resilient Destinations and Tourism argues that resilience should be understood as a fundamental part of sustainable tourism thinking for destination systems, and calls for better governance in implementation and management. Improving governance is the key issue in sustainable tourism development. 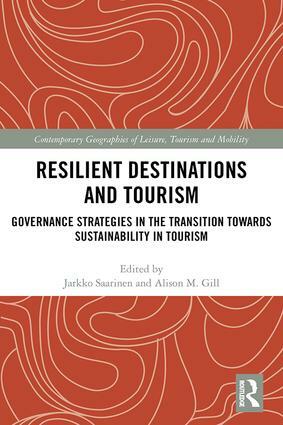 The chapters in this edited collection focus on resilient destinations from a governance perspective, in which tourism resilience is contextualized as an integral part of pathway creation in the process of moving towards sustainable tourism. The contributions to the book represent a range of theoretical and empirical approaches with a wide international scope. Resilient Destinations and Tourism calls for rethinking the meaning of sustainable development in tourism and looks at how sustainability and resilience could be integrated. This book will appeal to a wide range of research disciplines and students whose modules focus on the relationship between tourism and sustainability planning, governance, the environment, and hazards and disasters.